NEW! IEC 61010-2-081:2015 is available as IEC Standards+ 61010-2-081:2015 which contains the International Standard and its Redline version, showing all changes of the technical content compared to the previous edition. - added requirement for interlock systems containing electric/electronic or programmable components to Clause 15. 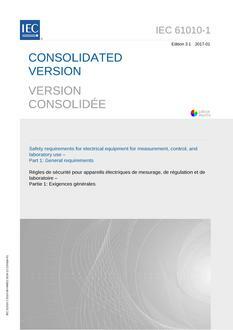 This publication is to be read in conjunction with IEC 61010-1:2010.